Row, row, row your boat, gently down the Steam. Playing VR games can be surprisingly good exercise -- ducking your head behind artificial barriers or waving your arms around to shoot enemy robots can work up a sweat. But what if you wanted a genuine workout? Well, VR fitness appears to be a rising trend, with several applications designed to alleviate the tedium of indoor gyms. 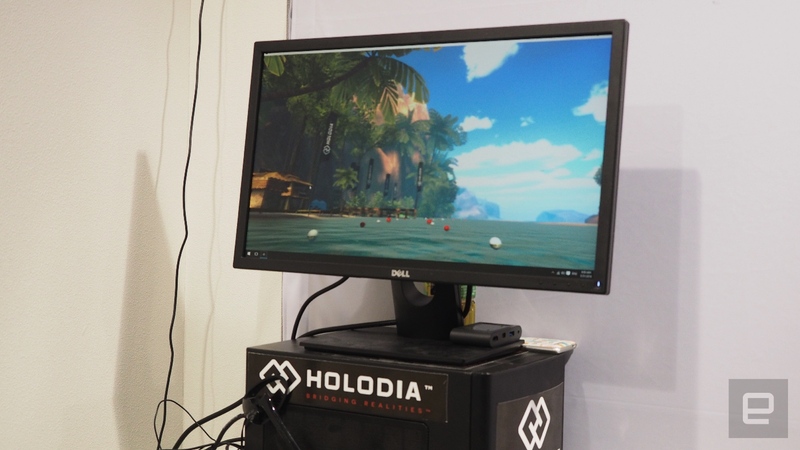 Here at Computex, I tried out yet another VR fitness apparatus that had me rowing through a tropical oasis while burning calories at the same time. This particular rig was designed by a startup called Holodia, which has been working on this idea for a few years now. The setup is simple. I positioned myself on a Concept 2 rowing machine that was hooked up to a PC that the company calls a Holofit computer. 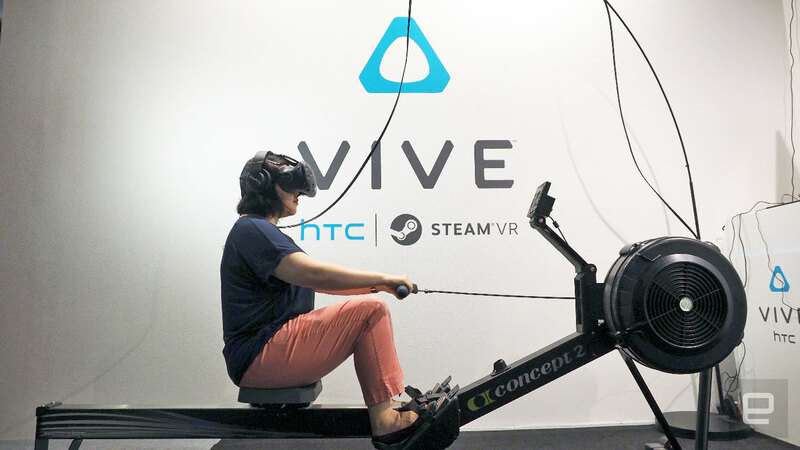 Then I placed a HTC Vive over my head along with a pair of headphones, and grabbed at the rower's handles. Holodia also has an overhang rig setup next to the machine so that the cables have room to move around as you're rowing. To start the game, I simply looked at which scenery I wanted to row in; the different options included oceans, rivers and beaches from around the world. I chose a tropical scene, which sounded like a nice respite from the busy Computex show floor. Before long, I was transported to a faraway land. I looked down at my hands and feet and found myself in a canoe. So I started to row. As I did so, a heads-up display in front of me showed distance traveled as well as how fast I was rowing. Perhaps it's because the rowing machine is my favorite cardio workout in the gym, but I genuinely had a great time. At the gym, treadmills and ellipticals typically have TV monitors attached to them, but rowers don't. With a VR headset, however, I'm now able to entertain myself while I row. Plus, the Holodia rowing simulation makes an otherwise tedious activity a lot more enjoyable. You're probably wondering if you can get this in your home. Well, you could, but it'll cost you. You can pre-order a Holodia rower kit now for a whopping $12,131. Even that's a discount, as the retail price is going to be $13,472. That does seem like quite a sum, but that price includes the Concept 2 rower, the HTC Vive, that aforementioned Holofit computer, plus all the various accessories and rigs that you'll need to set it all up. It looks like you can also just buy the base pack without the rower, but that's still around $12,000. The company promises to ship it this month, but only within the EU. Now, there have been other VR rowing applications before. One particular example that springs to mind is a game demo with the Oculus DK2 and a rowing machine that had you rowing around in space. But we haven't heard about it for a number of years, while the Holodia version looks a lot more polished. Still, at such a steep price, we're guessing the Holodia is really meant for gyms or fitness centers rather than individuals. But if you have the cash to spare and you haven't already invested in a VR headset, then the Holodia kit might be a compelling alternative to the gym. Stay on top of all the latest news from Computex 2016 right here.